Chinese Mid-Autumn Moon celebration is the equivalent of a Thanksgiving holiday. It is to appreciate rich harvests, hard work and family. A popular tradition of the Mid-Autumn Moon observance is to eat “moon cakes”. Moon Cakes are pastries filled with red bean or lotus bean paste with a yellow cooked yolk or salted duck egg in the middle to symbolize the moon. 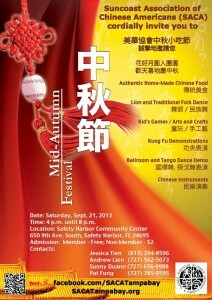 Suncoast Association of Chinese Americans (SACA) will be hosting the 2013 Chinese Mid-Autumn Moon Festival at Safety Harbor Community Center, 650 9th Ave South, Safety Harbor, Florida 34695 on Saturday, September 21, 2013, 4 p.m. until 8 p.m.
Open to public. SACA Members: free; Non-Members: $2.00 admission. Indoor event. Children are welcome. Free moon cakes for Members (2 per family, while supply lasts). There will be kids’ games, arts, crafts, food and entertainment for all to experience. There will also be on stage performances including lion dance, traditional folk dance, Tango and Ballroom dance demo, kung fu demonstration, and Chinese instruments.